A special limited edition book, ‘The Kelcey Walks’ lavishly illustrated with photographs from the last century with an intriguing ‘then and now’ photo section. Using a series of five walks around the village as written by the Reverend Edward Food-Kelcey in 1908, you can retrace his footsteps and easily visualise Quorn as it looked exactly 100 years ago. This book is a ‘must’ for anyone with an interest in the village or a desire to visualise their street as it appeared in days long gone. The style of the book is a joy to read, the Reverend leads you around the village pointing out places of interest, dropping in intriguing snippets of local gossip and relating anecdotes told to him by some of his elderly parishioners of rural village life in the 1800s. It evokes a time when the world seemed a more peaceful, tranquil place, almost devoid of traffic noise and pollution. For more information, read our Kelcey Walks extract or download the Kelcey Walks flyer. Note that all profits from the sale of this book will be earmarked to support heritage projects in Quorn village. 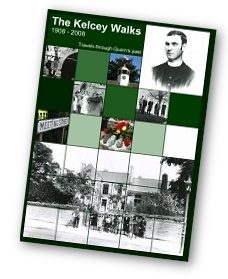 The book, The Kelcey Walks, can be purchased from the Quorn Parish Office, Quorn High Street. Full contact details and opening hours are here - Quorn Parish Council. Cost of the book is £6.00. It contains 72 pages and is sized A5. A 'Then and Now' section in the centre features photos of the period contrasted with the present day colour equivalent. Please include a note detailing that you would like "The Kelcey Walks"